Respecting our environment, and promoting the interconnectedness of all things, improves the quality of life for everyone. Growing Gardens is a 501(c)3 organization that teaches gardening skills and builds organic vegetable gardens in homes, schools and correctional facilities in Oregon. Our staff and volunteers support children, adults and families with garden beds, supplies, seeds, plants, mentoring and other resources. We serve people who have limited access to safe and nutritious food, and we empower them to become healthier, more physically active and self-reliant––thereby contributing to stronger, more sustainable and vibrant communities. Underserved communities, especially communities of color face food insecurity, gentrification, intentional disinvestment, disenfranchised, and crumbling infrastructure negatively impact neighborhoods. The food system in the United States is marked by corporate subsidies, environmental destruction, and systemic oppression. There is injustice in the way that food is grown and distributed and in the fact that not all people have the ability to produce, purchase or eat the food that they want to. There are extreme health disparities between economic classes and between racial and ethnic groups, including health disparities related to diet, food access and quality. We believe that access to good, healthy, nourishing, culturally appropriate food is a basic human right that everyone should have. We know that our organization is stronger when we have a diversity of identities, backgrounds, and perspectives collaborating together towards a common goal. We recognize that in order to truly promote equity we must be aware of injustices past and present and prioritize our policies and systems in ways that dismantle the current hierarchy. We respect the inherent knowledge and expertise of those we work with. We actively seek out and elevate the voices of our community. Our popular education approach emphasizes hands-on learning and peer support. We work toward helping people become self-sufficient and support them in reaching their goals. Our work focuses on schools where most students receive Free and Reduced Lunch as an indicator of high-poverty. 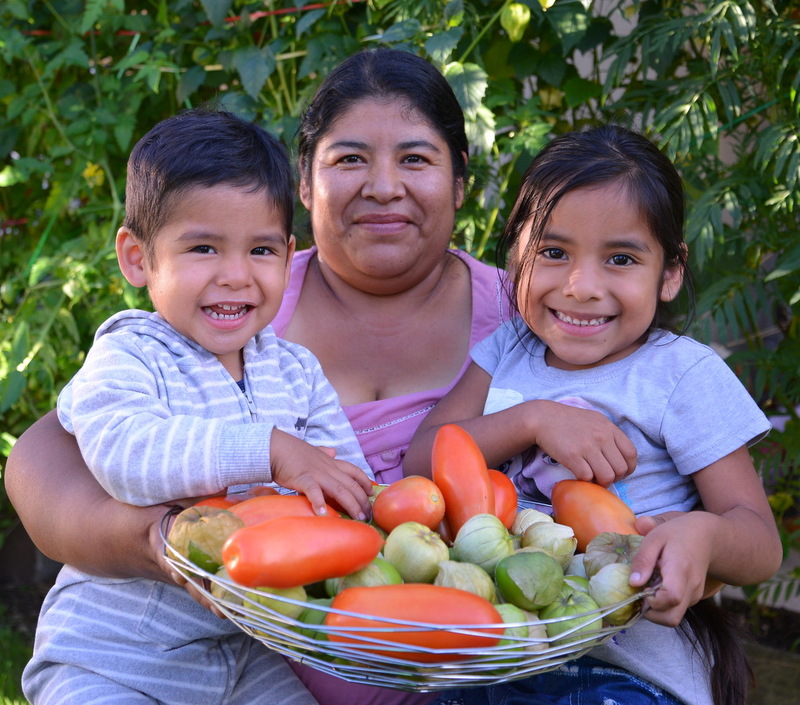 We meet many of our home gardening families through school-based food pantries. Half of our home garden participants are Spanish speaking, and participate in the program through Spanish speaking staff. We are working towards developing programming in other languages. All of our Community Organizers, who recruit new home gardeners and lead the program implementation, were themselves participants in the program. Through our school programs, we work to build the local leadership within the school community to determine the objectives of the program and take over when Growing Gardens transitions out. In our program in correctional institutes, we treat inmates with dignity and believe in their ability to improve their futures. We understand that this is a process that each of us has a personal responsibility to work on and with others to design and continually perfect our organization’s diversity, equity and inclusion. We at Growing Gardens see that a garden is the perfect place to address systemic change and we intentionally focus on the whole family through hands-on learning where everyone feels welcomed to participate, we set the table for people to learn skills, build leadership, and grow in a way that is true to themselves. We see individual change as the seed for growing more resilient and positive communities. Growing Gardens promotes a just society by challenging injustice and valuing diversity. We believe that all people share a common humanity and therefore have a right to equitable treatment, support for their human rights and a fair allocation of community resources. We strive for a time when all people are not discriminated against, nor their welfare and well-being constrained or prejudiced on the basis of gender, sexuality, religion, political affiliations, age, race, belief, cultural background, disability, location, social class, socioeconomic circumstances, or any other characteristic of background of group membership. We also believe wholeheartedly that social justice imposes on each of us a personal responsibility to work with others to design and continually perfect our institutions as told for personal and social development.